Agro Kusuma tourism is located in Ngaglik village, Batu district. One stop shooping service has implemented in Agro Kusuma Tourism. 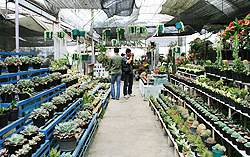 The unforgettable experience can found here after visiting apple plantation, flower, coffee, strawberry, and hydroponics vegetables (non- insecticide). Agro tourism, which has supported by fancy hotels, lies in 17-acre plantation. This tourism object allows the visitors to pluck apple directly from tree. We just meet this interesting activity in Agro Kusuma tourism. You can pick the apples and oranges in the plantation area and tasted them. Feel the fresh and health fruit from its tree. You may see the process of drying the coffee, or buy vegetables, which can cook soon. Since the plantation is wide, it can use for jogging, bicycling, playground and riding a horse. Besides, it has a mini zoo, camping ground, and swimming pool. Do not forget, before leaving Kusuma Agro Batu, you can buy souvenirs of its products, including; jenang, apple vinegar, and orange. We also able to enjoy various food products of Batu city, such as; apples, jamb, brem apple and strawberry. Agro Kusuma tourism is facilitated with mini zoo, green house, bar, restaurant, coffee shop, warm swimming pool, badminton hall, tennis court, volley field, etc.